The Driver Training Complex at GPSTC is a comprehensive facility that allows public safety personnel the practice basic emergency vehicle response operations in rural and urban areas as well as skid recovery, precision maneuvers and specialized vehicle operation. The complex consists of five separate tracks, each designed to build skills in different areas of emergency vehicle operations. The one-and-a-half mile emergency response course allows public safety professionals to practice elevated speed driving and vehicle control while negotiating curves that are typical of those found on many rural Georgia roads. Emphasis is placed on appropriate decision making during pursuits. Otherwise known as the “cone course,” the Tactical Driving Course is designed for teaching students a variety of skills including weight and traction transfer, straight braking, braking-in-turns, ABS braking, and maneuvering around obstacles at increased rates of speed. Practice on the Tactical Driving Course prepares students for emergency vehicle operations in an urban setting. 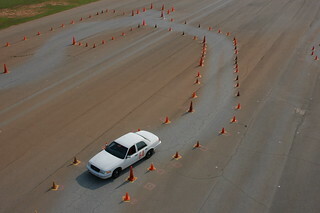 GPSTC’s Skid Course allows students to practice skid recovery on a wet track through the use of modified vehicles that allow instructors to control brake locking mechanisms. Students learn the difference between over- and under-steering as well as hand management during skid recovery. The PIT and Motorcycle Training Track is a straight 1,500-foot long paved road that allows students to practice a precision intervention technique or resist being immobilized from an attacker. The Basic Motorcycle Officer course also makes use of this track, allowing students to learn the safe operation of motorcycles at various speeds. The ATV Training Track utilizes the natural landscape on the GPSTC grounds to allow students to learn the basics of ATV operation that is increasingly used in search and rescue operations on terrain where regular emergency vehicles cannot be deployed. Courses conducted on the ATV Training Track emphasize fundamentals such as straight line braking, side-hilling, descending embankments and navigating obstacles.